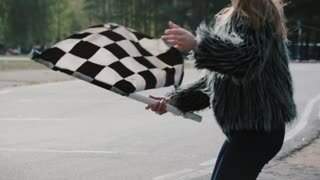 Search Results for "race flag"
Cheerful young woman jumping and waving a race checkerd flag. Go-kart track on the background. Back view of a woman is holding a waving race checkerd flag. Go-kart track. Go-kart track. People racing in karts. Blurred red waving flag. Sunny autumn day. 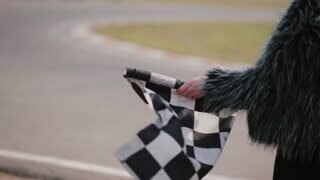 Man holding and waving Checkered race flag in slow motion at finish line on a raceway. Hands of unidentified person applauding. Victory, achievement, success and sport concept. Checkered racing flag and the British flag shake in the air in the blue sky background.